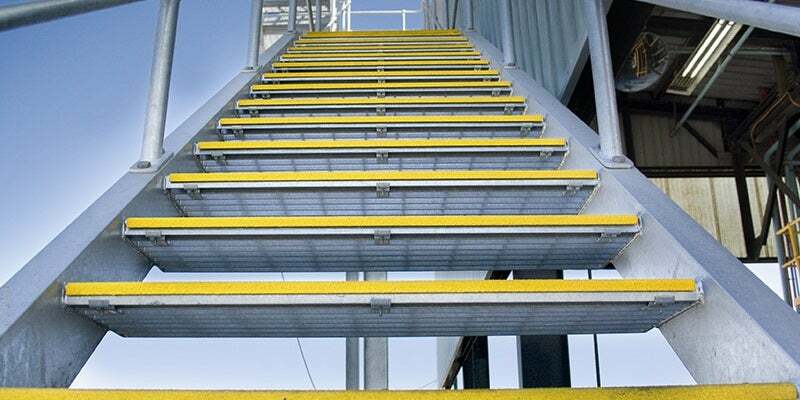 SafeMate Anti-Slip specialises in non-slip floor, stair and ladder technologies for a wide range of sectors, including the international oil and gas market. The company’s cost-efficient, non-slip solutions are resistant to chemical exposure, high moisture and salt environments, heavy impacts and all-day operations, which can lead to slippery stairs, ladders and walkways. SafeMate Anti-Slip stair nosings and cappings are designed to prevent slips, trips and falls on stairs in adverse environments. A steel support and a sharp, long-lasting anti-slip surface offers a firm footing on the leading edge of the stair. The company provides bull nose, offshore and stair nosings to suit a variety of surfaces and applications. SafeMate Anti-Slip stair treads aim to minimise the risk on stairways and are ideal for interior applications. Combining an aluminium backing with a durable, anti-slip insert, they provide secure footing for end users. SafeMate stair treads can be used to cover and re-profile damaged steps. The SafeMate Coat ‘N’ Sprinkle system is a two-coat floor product that provides an anti-slip texture covering. It is suitable for applications on asphalt, concrete, epoxy, metal and wooden surfaces. SafeMate offers high-quality non-slip products that are designed to fix slippery tile floors in kitchens, changing rooms and food preparation areas. Damage caused by moisture, dirt, oils and food scraps can simply and effectively be corrected by a range of non-slip step and floor solutions. SafeMate Anti-Slip helps clients prevent expensive accidents with industry-compliant non-slip flooring, including the Slipfixa range for all floor, stair, walkway, ramp and step surfaces. SafeMate’s specially designed GlowMate glow-in-the-dark solution allows high visibility in poorly lit environments, which can save lives in an emergency evacuation. GlowMate provides a clear and visible escape route where smoke, power failure or low-light might otherwise disorient workers. Founded in 1974, SafeMate Anti-Slip is an Australian provider of non-slip solutions. Supported by a full ten-year factory warranty, all products are manufactured to strict ISO 9001 and American Bureau of Shipping (ABS) quality standards. They use the highest quality materials, designed to withstand the toughest operational conditions and comply with industry regulatory standards worldwide. Operational, maintenance and operational health and safety (OH&S) managers use SafeMate Anti-Slip to provide time-effective and cost-efficient non-slip solutions.